Animals are not unlike us when it comes to certain emotions; stress and anxiety is something they share with humans. Unfortunately cats cannot communicate the same way humans do and so they often express their anxiety through unwanted behaviors such as scratching, spraying, using the toilet where it’s inappropriate and excessive meowing. 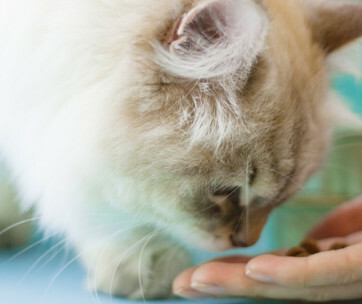 Watching your feline friend go through anxiety can be incredibly upsetting and frustrating. Luckily, there are solutions available that can really help. If you have had your pet checked by a professional and the problem still persists, yet you still want to avoid medication, then you can try a feline spray which may either contain soothing scents or special pheromones which help to relax your cat. 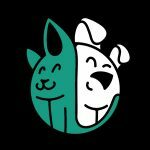 What we liked about the Comfort Zone Cat Calming Spray, was that it was recommended by veterinarians and it’s one of the leading brands for behavior control. This is an unscented product which uses special pheromone technology to naturally and safely calm cats and help eliminate unwanted behaviors such as scratching and mark making around the house. The spray can be used almost everywhere and is normally used for spot treating areas in the home where your cat has targeted such as sofas, bedding and door frames. It can also be used to spray the inside of a cat carrier in advance of a veterinary visit. This is a safe product which can be used on upholstery and it’s also drug-free. The company are that confident that you will like it, they even offer a money back guarantee too. This product is also highly recommended by veterinarians and well known amongst cat owners around the world. Feliway for cats has been clinically proven to reduce stress levels, therefore reducing unwanted behaviors such as spraying and scratching. The way the product works is my mimicking a cats’ pheromones in order to make them feel more relaxed. 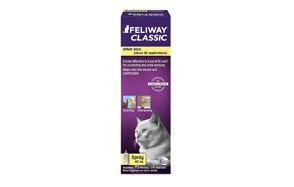 The theory behind the product is: wherever you apply the Feliway spray, your cat won’t want to spray there anymore. This is the perfect product to use alongside the Feliway diffuser (which can be topped up with a Feliway refill). This cat pheromone spray works a little different from some of the other brands we saw on the market. This cat calming spray has been designed to be used immediately during or after your cat’s negative behavior and works in two different ways. Firstly, it emits a hissing sound to get the cat’s attention and then secondly it releases a pheromone which naturally calms and refocuses the cat by relaxing them. This is a scientifically proven product which is completely safe to use – when used properly. The scent is nice and relaxing for humans too with lavender and chamomile. This product is said to be significantly more effective than other noise making products designed to modify behavior. If you are looking for a pet calming spray that will relax your cat naturally then the Pet MasterMind Cool Kitty Cat Calming Pheromone Spray would make a good choice. This spray uses a safe and natural formula that helps to calm nervous cats. Perfect for trips to the vet, moving house or introducing new animals into your cat’s territory, a few sprays can make a big difference. Use this product to spray on furniture and bedding to naturally calm your cat. If you’re not 100% happy with the product you can get your money back too. This is a 100% natural pet calming spray that can be safely used on cats and dogs. 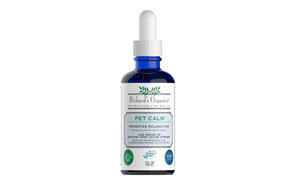 Used to treat stress and anxiety, Richard’s Organics Pet Calm is perfect for short term use and can effectively calm your cat’s nerves before an anxiety-inducing event such as vet visit, travel or a sudden change in environment such as family get-togethers. This natural solution is totally drug-free and has been created using valerian root extract, chamomile, skullcap extract and passion flower extract – all key ingredients all the promotion of healthy sleep. Unlike other sprays this product is used directly on your cat and can be applied straight from the dropper or mixed with food every 4-6 hours. This calming cat spray provides a long lasting concentrated formula that works fast to relax your feline friend. It’s a non-sedating formula that can reduce stress and hyperactivity in stressful situations. This spray has been designed to be used in cat carriers and areas where your cat has displayed negative behaviors (not directly on the cat) and is perfect for use before vet visits and changes in the cat’s environment. Another product by SENTRY, what we liked about this particular spray was that the pheromone technology that is used has been clinically proven to reduce stress levels in cats. If you’re looking for something to reduce excessive meowing, scratching and inappropriate marking then these cat calming products won’t let you down. This is a safe and effective product that can be used directly on the cat’s bed and furniture. It also has a nice lavender and chamomile scent. Please note: result times can vary depending on the cat, the owner and the environment. The pheromones in this cat pheromone diffuser refill have been designed to mimic a mother’s natural nursing pheromones and have been made for use in a cat calming diffuser (not included). Use in a multi-cat household to encourage your cats to get along better and to reduce scratching, fighting, hissing and other aggressive behaviors. This is a totally natural drug-free formula that is recommended by vets and clinically tested to be 90% effective. There are many different cat calming products on the market and it can be difficult knowing which type to buy. Not every product will work for every cat and so it may be a case of testing a few to find which works best for kitty. If you have never used a cat calming spray before then it’s always good to opt for the products which have been recommended by vets first. These are often clinically proven to get fast results. If you have multiple cats in the house then a cat calming diffuser can be a good first choice as these work by releasing pheromones into the environment and can calm your kitties together at the same time. If you find that this isn’t effective enough then you can couple a cat calming diffuser with a calm calming spray to target specific areas where the cats have sprayed or displayed other negative behavior such as scratching and inappropriate toileting. Some cat calming sprays are designed for use around the house and are safe to use on furniture and bedding but not safe to use on cats, whereas other pet calming sprays work the opposite and are designed to be used on the cat and not on furniture - please make sure you fully read and understand the instructions before use. 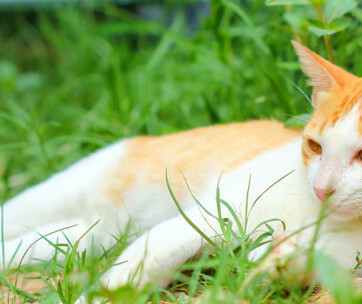 Certain cat breeds such as Bengals and Siamese generally make more noise than others. Regardless of breed, however, if your cat is excessively meowing then they may be trying to tell you something. As cat’s cannot speak the human language, one of the ways that they communicate to us is through meowing and making other noises too. When they’re hungry they meow, when they’re angry they hiss and when they are watching birds through a window they make a type of chirruping sound. When a cat starts to excessively meow and there is nothing wrong with their physical health then they might be telling you that they are stressed or anxious. A cat calming spray can really help in this situation. If your cat is toilet trained but has started suddenly eliminating outside of the litter tray then they are strongly communicating to you that something is not ok. They may not feel safe using the litter tray or just want to send you a very obvious message. Make sure you check their health first, as this can be a sign of physical illness. As above, if everything is ok then they will need a calming product to stop this negative behavior. When a cat marks his or her territory then it is feeling under threat. Perhaps you have just introduced a new animal into the house, a new cat has moved into the neighborhood or you have simply just moved some furniture, cats can respond negatively. Cats are creatures of habit and any change in their environment can cause them a great deal of stress. If spraying is a new behavior then the cat is displaying signs of anxiety. 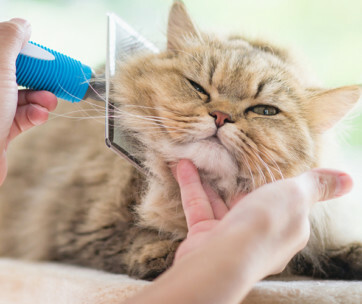 If your cat doesn’t usually bite or scratch furniture then this also can be a sign that something isn’t ok. Scratching is one of the most common negative behaviors that people want to change. Fortunately, it’s one that responds well to cat pheromone sprays and diffusers. There are lots of benefits to using a cat calming spray and it makes a smart investment for any cat owner. Your cat can be the sweetest, quietest little ball of fur at home and may not have ever displayed aggressive behavior. 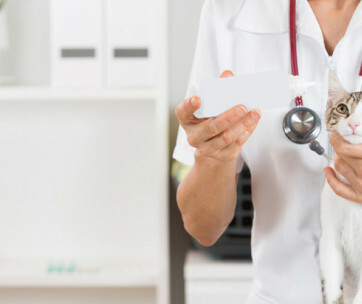 Take them to see the vet and your sweet fur ball can instantly turn into a tiger. Fear can make even the most gentle animals aggressive and there’s nothing more scary than a trip to the vet. Cats are creatures of habit and don’t like change. So when you bundle them up into a tiny cat carrier, take them out into the noisy world, only to then be poked and prodded by a vet, you can imagine how they might feel. 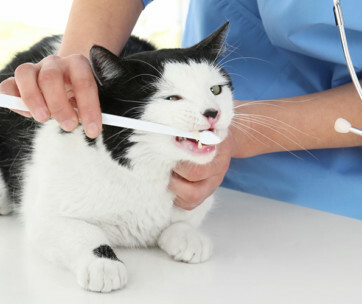 Using a cat calming spray in advance of a vet visit can really help reduce stress levels. As we said above. Creatures of habit. So moving house and essentially changing the cat’s world is one of the most stressful things that a cat can go through. They have a new indoor environment to get used to and if they are outdoor cats they have to check to see what the local threats are in the neighborhood. A calming diffuser in the house can help your cat to settle. This is rarely a smooth process. When you introduce a new cat, dog or even a newborn baby into the house, your cat will feel threatened. This is when they are most likely to display bad behaviors such as scratching and spraying. Even short term changes in the cat’s environment can cause a great deal of stress for the cat. If you are planning a party and have a number if new people coming to the house, or more people than usual, then it might be a good idea to lock the cat away in a room with a litter tray, cat calming diffuser and a nice warm place to hide. Cats like routine and they like to know their own environment. Any changes to this will likely make them very anxious. If you know there’s going to be loud noises outside or inside the house then understand that this will make your cat nervous. You can help your cat to stay relaxed by introducing them to a cat calming spray ahead of the event. Q: Do cat calming sprays actually work? A: Some cat calming sprays work with natural ingredients that can naturally calm your pet, whereas others work by introducing pheromones into your cat’s environment. Pheromones are chemicals in the body that ‘speak’ to other members of the same species. This is why we can sometimes find ourselves feeling a strong attraction to someone and not know why...it’s the pheromones! Many pheromone sprays that have been designed for cats contain a manmade pheromone that has been created to mimic the pheromones that cats release when they mark their territory with their face. 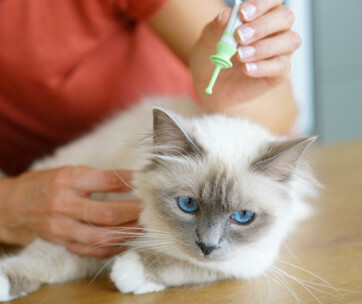 Cat pheromone sprays are often recommended by vets and have a high success rate. However this is largely dependent on the cat, their background (rescue cat etc) and the owner. There is no correct answer to this question as the sprays can be super effective for some cats and totally ineffective for others. Q: Are cat calming sprays safe? A: Cat calming sprays are safe to use and species specific so won't effect you or your dog. You must read the instructions fully before using the spray as obviously when the sprays are used incorrectly they’re no longer safe. Q: When to use cat calming spray? A: Cat calming sprays are designed to be used when your cat is displaying unusual behaviour problems or signs of nervousness. If your cat is excessively meowing, scratching furniture, spraying on door frames or not using the litter tray correctly then it’s a good time to try a cat calming spray. With any of these signs it’s always best to consult a professional in the first instance in order to rule out any physical illness. Once the cat has the all clear it might then become apparent that the issue is more of a nervous behavior triggered often by change. Try to eliminate the stress for your cat first. If that isn’t possible then it’s time to use a cat calming spray. Cat calming sprays are often used ahead of stressful situations such as veterinary visits, moving house or getting a new pet. They can also be used for immediate relief with the diffusers rated as more effective for this purpose. A: You might not see immediate results with cat pheromone products. Generally speaking a lot of sprays such as Feliway can take up to x 7 days to work and experts recommend that you use the product for at least one month. It’s hard to say how long such products last as this depends on the root cause of the cat’s anxiety. Luckily a diffuser can be used as a permanent solution to create a relaxed environment for your cat. Other products provide more short term solutions and the effects can reduce quite quickly. 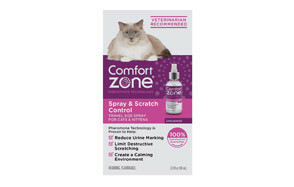 Our favorite cat calming spray was the Comfort Zone Spray & Scratch Control Cat Calming Spray. This product comes highly recommended by professionals and is one of the leading brands for behavior control. This spray is totally unscented yet uses special pheromone technology to naturally and safely calm cats. It’s perfect for use on cats who are excessively meowing, scratching furniture and mark making around the house. Use the cat calming spray as a targeted spot treatment on furniture, door frames, couches and bedding. You can also use the product on the inside of cat carriers in preparation for a vet visit. The company provide a money back guarantee if you're not entirely happy with the product.